What is the Annidis RHA™? The RHA™ was developed to provide eye care professionals with a broadly based screening tool for early detection and an augmented view of a variety of pathologies. The RHA™ assists eye care practitioners in understanding the pathophysiology of disease and how metabolic changes result in early pathology by collecting and combining multi-spectral information that highlights specific metabolic signatures. 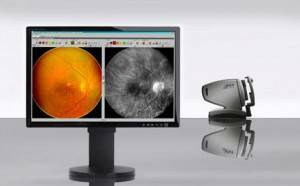 The RHA™ system was developed specifically to extract, process and present detailed retinal health information derived from multi-spectral image maps. Our technological focus on correlating metabolic and conventional anatomical information, required the introduction of advanced engineering. Multi-spectral examination of the eye, combined with advanced software processing allows us to display the key structures under investigation. The RHA™ is ergonomically designed for the safety and comfort of both the patient and the operator, with touch screen controlled motorized movements for patient set-up and streamlined software. The imaging system is equipped with a scientific grade imaging CCD camera with quantitative capability which captures 4 megapixels per spectral slice. The scalable multi-spectral imaging architecture accommodates multiple LED light sources to provide comfortable safe imaging in specific spectral windows, while automated spatial and spectral filters further enhance system flexibility and specificity. Embedded software delivers quantitative spectral reflectance and scattering maps to the image processing software. Overall, the RHA™ system has been designed for ease and speed of use. The instrument can be operated in conventional placements, or remotely for telehealth examinations. The RHATM is designed as a platform to support ongoing improvements as new medical discoveries become available. RHA Report™ is a custom software package specifically developed to review RHA™ images in the examination room. It was designed in consultation with practicing optometrists to fit in with the time constraints of their busy practices. It allows for efficient review of images, while highlighting potential issues. It was designed to allow the eye care professional to easily monitor and track changes over time for a longitudinal comparison.